Time’s Almost Up: Comment to the FDA TODAY! Have you told the FDA how important it is to include migraine in their new program? Tomorrow’s the final day to do so. Your participation is so crucial that I’ll beg you with lots of exclamation points and all caps: PLEASE, PLEASE SUBMIT YOUR COMMENT TODAY!!! According to a World Health Organization analysis, migraine is responsible for more lost years of healthy life in the U.S. annually than epilepsy, multiple sclerosis, ovarian cancer, and tuberculosis combined. Also according to that analysis, severe, continuous migraine is as debilitating as quadriplegia. Migraine is unlikely to kill those of us who have it, but it sometimes feels like death would be a better alternative. Whether chronic or episodic, migraine wreaks havoc on our lives and our families. It deserves to be recognized and studied with the same resources as any other life-changing illness. Help Make Migraines Visible, the theme of this year’s National Migraine Awareness Month, sponsored by the National Headache Foundation is full of opportunities for you to learn more about migraine* and a chance for you to help others understand what migraine is and what its like to live with this oft-dismissed disorder. This isn’t a sit-back-and-watch awareness event, but one that engages those most knowledgeable about life with migraine — patients! — to help spread the word. You don’t have to commit to anything major, just speak up through social media or your blog, if you have one. Patient advocates have already done a lot of the leg work to get you started! Call to Action! 50 Tweets for Migraine Awareness: This is soooo easy — all you have to do is copy and paste! Patient advocate Ellen Schnakenberg has created 50 different tweets of migraine facts, complete with hashtags, for you to copy and share on your preferred form(s) of social media. National Migraine Awareness Month Blog Challenge: 30 blog prompts for the 30 days of June, created for you by the folks at Fighting Headache Disorders, Teri Robert and the aforementioned Ellen. If you don’t have a blog, share your thoughts through Facebook. At the very least, check Fighting Headache Disorders each day for the blog prompts and which bloggers have written posts for that day. Share the most inspirational or helpful posts on your social media accounts to let friends and family learn a bit about migraine. Visit Migraine.com, where one of the site’s patient advocates, including moi, will be responding to a prompt each day. 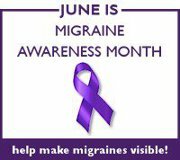 I’ll be responding to prompts when I can, tweeting migraine awareness facts, and asking you all questions on Facebook. Follow TDHblog on Twitter and like The Daily Headache on Facebook so you don’t miss a bit! *NHF will host four online chat sessions with experts and a free educational event in Chicago, and will be re-introducing its Migraine Masterpieces art contest.